PROM ALERT: A profusion of prominences is dancing along the sun's eastern limb: image. If you have a solar telescope, take a look! The "fish" are the stars of open cluster NGC 1245 located downstream of Holmes' developing tail. NGC 1245 is a swarm of hundreds, perhaps thousands, of stars 800 light years from Earth. It shows up nicely in 10+ minute exposures of the comet through amateur telescopes. 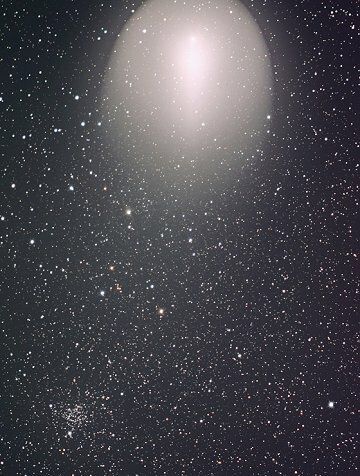 Comet 17P/Holmes is no longer the bright naked-eye object it was when it first exploded in late October. But it remains an easy target for binoculars, night vision goggles and backyard telescopes. After sunset, point your optics at the constellation Perseus and scan around for the Jellyfish: sky map. You can't miss it. 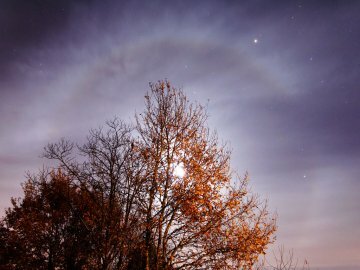 "It was fun trying to guess the luminosity of the halo by watching the clouds coming toward the Moon," says Laurent Laveder who made the movie in Bretagne France on Nov. 29th. "I used a Canon 350D to take 68 images 30 seconds apart. Each frame is a 15 second exposure at ISO 800." more images: from Jon Hayden of Milwauke, Oregon; from Stefan Gajdos of Modra, Slovakia; from Brian Karczewski of Hemet, CA; from Marsha Adams of Sedona, AZ; from Mike Caplan of Wadsworth, Illinois. On December 2, 2007 there were 907 potentially hazardous asteroids. ©2007, SpaceWeather.com -- This site is penned daily by Dr. Tony Phillips.